This listing is for one 4 oz all natural Whipped Body Butter. Scented with Spa clean and crisp fragrance (Indulge in notes of modern rose and lily brightened with hints of orange, lime and ozone). This body butter is great for all type of skin but especially for dry skin. Coconut oil which is rich in many proteins. These proteins keep skin healthy and rejuvenated, both internally and externally. Proteins also contribute to cellular health and tissue repair, along with a wide range of other essential activities within the body. Camelina Oilis an exceptional Oil. Prized for its potent Essential Fatty Acid content, Camelina is beneficial to those suffering from psoriasis or eczema, as it is about 10 times higher in linoleic acid and alpha-linolenic acid than most other Vegetable Oils. This also makes Camelina an ideal ingredient for anti-aging skin. Camelina Oil can help to repair damaged cells and increase elasticity in the skin. 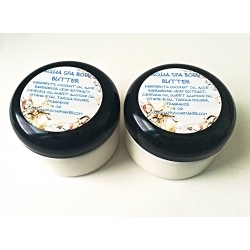 This Whipped Natural Body Butter with Hemp and Argan Oils moisturizes and protects the skin from dehydration. 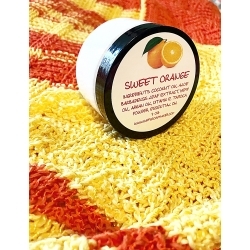 Scented with Orange (sweet) Essential Oil this body moisturizer will immediately hydrate, soften and feed your skin nutrients for a healthy, glowing complexion. Hemp Seed Oil (Cannabis) protects the skin from free radicals and provides the body with essential nutrients required in order to maintain epidermal lipids, skin’s water barrier, elasticity and softness. Argan oil contains high concentrations of vitamin E and moisturizes and nourishes your skin, making it smoother and firmer. It protects the skin from environmental aggressors and helps to regenerate the epidermal lipid barrier. Coconut oil is a great skin softener and helps you do away with dry and hard skin conditions. Has a high moisture retaining capacity so it acts as an excellent moisturizer for your skin. Contains mostly fats, so it acts as an emollient providing a softening and soothing effect. Also it contains Aloe Vera extract which moisturizes the skin. It enhances the appearance of dry or damaged skin by reducing flaking and restoring suppleness. Now here’s the trick about body butter. It’s best to rub in a light layer of the body butter just after a hot shower while the pores of your skin are still open. It may feel a little greasy just after application, but within minutes it will soak into your skin. The result is soft and glowing skin (not greasy!). Remember that body butter is thick and luscious. A little bit goes a long way! This listing is for one 4 oz all natural Whipped Body Butter.